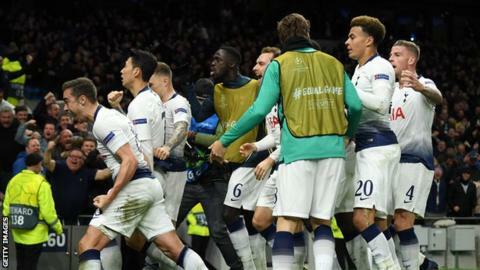 Manchester City remain favourites to progress in the Champions League - despite suffering a narrow quarter-final first-leg defeat, says Tottenham Hotspur manager Mauricio Pochettino. Pep Guardiola's City went down 1-0 in the all-Premier League tie at Tottenham Hotspur Stadium. Son Heung-min scored the winner after Harry Kane had gone off injured. "There is still a lot of work to do. It will be a completely different game in one week," said Pochettino. Champions League & Europa League: Who will qualify in various scenarios? Spurs trail City by 16 points in the Premier League table but Pochettino's side produced a battling performance to take a narrow lead into the second leg on 17 April. "I am happy with the performance and I am happy with the way we approached the game," added Pochettino. "The performance was very good and that is the challenge for the future - to show that level and be consistent. "To win the first leg gives us the belief and we will go there and fight a lot." City lost for only the sixth time in all competitions this season, but Guardiola is confident his side can turn it around in the second leg at the Etihad Stadium as they chase an unprecedented quadruple. Sergio Aguero saw his early penalty, awarded on a pitchside video review by the referee after Danny Rose was judged to have handled Raheem Sterling's shot, saved by Hugo Lloris. "I don't feel we played badly, we created chances and we controlled the game," said Guardiola, who has yet to win the Champions League at City. Guardiola opted to start without key midfielder Kevin de Bruyne, only opting to send him on as a substitute in the 89th minute. "I decided to play with two holding midfielders in that position. We have the second leg, we spoke about that before the game," added the City boss. "We played to score a goal, unfortunately we could not score but we have the second game. "It is a bit more complicated now but we are going to push each and we are going to try." The issue for Spurs will be how big a miss will Harry Kane be? I can't see him being fit for next week. To a man I thought Spurs were excellent and they will need to be as good again in the second leg. I think leaving Kevin de Bruyne on the bench was a big call but you look at the Manchester City team and other than left-back, do they really have a weakness?